I was looking for a midweek dinner using the “one skillet” search in my recipe database. 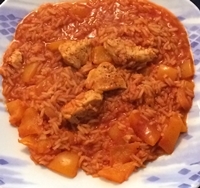 I found this Cajun chicken and rice skillet recipe from 12 Tomatoes. I pretty much followed the recipe as written, t though I omitted the onions as Terry can’t do onions. I did cut the recipe in half. It turned out well. It was very tasty and quite filling. I could have made it with half the rice. I almost forgot the tomato paste but that got thrown in too. It’s one that we could do again.